Finisher Medals will be awarded to all the finishers of the Half Marathon, 30KM, 10KM, and 5KM distances. We look forward to providing you with a great momento of your accomplishments! 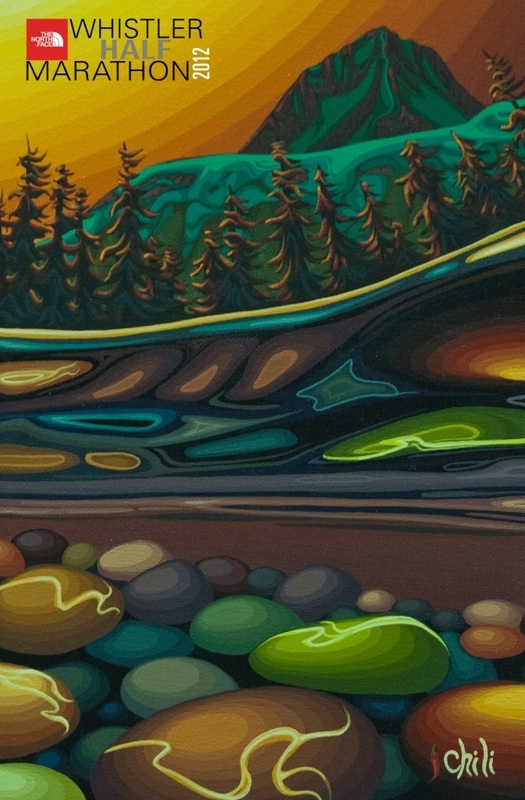 Our hearts are heavy at the news of Whistler's beloved artist Chilli Thom who passed away yesterday after a long battle with cancer. Like many others, Chilli had a place in our hearts. He was an early supporter of our event and was the artist who produced our Finisher Posters for the past 5 years. His artwork also adorns the top sheet of our Half Marathon Champions Trophies - a pair of Prior Skis. His "you can do anything you set your mind to" attitude will live on in the spirit of our event forever. Sending much love to friends and family of Chilli today. Being born and raised in British Columbia has offered me an interesting and inspiring life hiking and exploring the vast and beautiful wilderness of the Pacific Northwest. 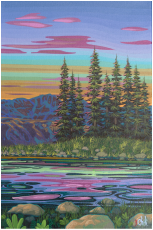 The primary inspiration for my work has always been the natural world and the amazing landscapes of B.C. Traveling this incredible province during my 6 years as a wilderness guide has left lasting visions in my mind. From the rugged West Coast of Vancouver Island to the high summits in the B.C. Coastal Range to the surf beaches of Central America the outdoors continuously inspire me. Voted “Whistler’s Favourite Artist” every year since 2002 is a real honor. Being based out of Whistler has always been an advantage. The mountains and surroundings are a constant source of inspiration and the town is such and international draw. The world comes to us and because of this I have been able to show and sell my artwork all over the globe.